One of the biggest leaps forward in human history was when we started to use the movements of the stars, sun and moon to tell time. And as far as we know, we are the only animals that do. You may find yourself noticing a slight bend in space and time as you approach the Observatory, or perhaps it was just the long trek up the steep hill that made the minutes seem like hours! Eventually, humans invented machines to keep track of the units in which we divided the world and some would argue that these machines now rule our lives. But no matter how you feel about clocks and schedules, you can’t deny the ingenuity and skill that has gone into inventing, improving and crafting timepieces. And if you are a steampunk fan, you probably can’t get enough of the shiny gears and complex mechanisms that had their heyday in the 18th and 19th centuries. 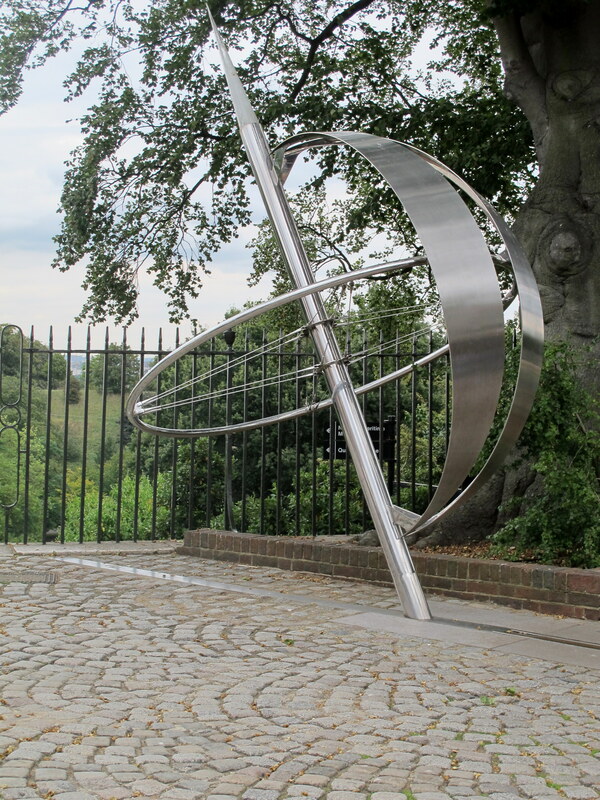 The Royal Observatory (also called the Greenwich Observatory) is the home of the Prime Meridian line, and the site for calculating Greenwich Mean Time since the 19th Century. This means that even more than anywhere else it has been imperative that they keep accurate time, and they celebrate this history in their exhibits. After I was done at the Longitude Punk’d galleries, I took a stroll through the rest of the Observatory and I found amazing machines for seeing the stars and terrific time-keepers. I had accidentally used up a lot of my battery during the first half of the day at Longitude Punk’d and the Cutty Sark, but even with a full battery I don’t know if I would have been able to fit all of the beautiful pocket watches, nautical devices and astrolabes onto my memory card anyway! Here’s a sampling of what there is to see in the history galleries. I am not even sure what this us, but it sure looks steampunk! In addition to the Observatory, you can also visit the Astronomy Center for free. There are lots of exhibits there for amateur astronomers, as well as London’s only planetarium. Have you ever visited the Royal Observatory or Astronomy Center? Did you have a favorite part?